Enterobacteriaceae are now the predominant pathogens isolated in patients with liver cell failure associated with bloodstream infections. We conducted a retrospective cohort study of patients who were admitted for the diagnosis of hepatorenal failure (HRF) between June 1999 and May 2008 to investigate the risk factors of Enterobacteriaceae bacteremia (EB). EB was defined as the isolation of an EB species from at least one blood culture within three months following diagnosis of HRF. Variables were collected from the medical records and analyzed in relation to EB. Twenty-four (32.5%) of the 73 patients developed EB. The origin of EB was abdominal in 21% of the patients, urinary in 12.5%, pulmonary in 16.5%, and primary in the remaining patients (50%). Two-thirds of EB occurred within 10 days following the development of HRF. The main pathogens were Escherichia coli (44%), Enterobacter species (20%) and Klebsiella pneumoniae (22%). Eighteen patients (75%) with EB died. Variables significantly associated with EB after multivariate analysis were a model for end-stage liver disease score >20 [odds ratio (OR): 2.84, P <0.02], posthepatitis B liver cirrhosis (OR: 4.72, P <0.05), posthepatitis C liver cirrhosis (OR: 3.48, P <0.05), and initial level of serum creatinine on admission to intensive care unit (OR: 2.56, P <0.02). EB is a frequent and severe complication of HRF. Patients with posthepatitis cirrhosis B and C, higher serum creatinine, and severe liver cell failure score have a high risk of developing EB. Gram-negative Enterobacteriaceae found to be the responsible organisms for serious infections such as spontaneous bacterial peritonitis, pneumonia, urinary tract infection, and septicemia that can be occurred in patients with hepatorenal syndrome and have been associated with adverse clinical and economic outcomes, increasing the risk of complications and thus the mortality rate. Consequently, the proposed study is to determine the impact of Enterobacteriaceae bacte-remia (EB) on the mortality and to investigate the risk factors associated with EB in those patients. 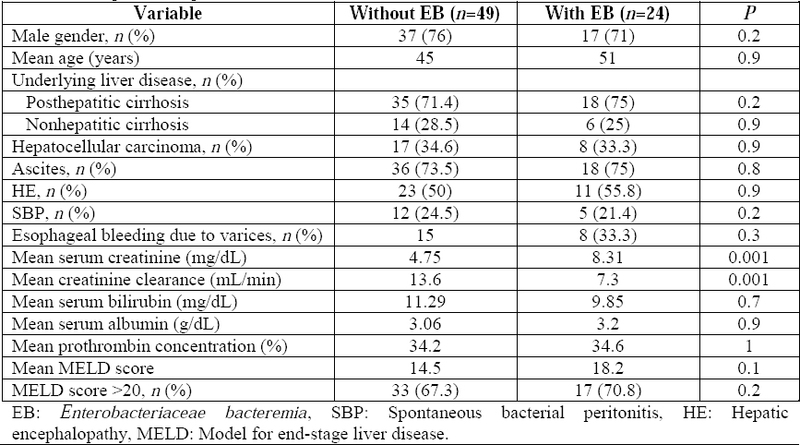 A retrospective, single-center study conducted on 73 patients who were admitted in Cairo University Hospitals with a diagnosis of hepatorenal failure (HRF) between June 1999 and May 2008 to investigate the impact of EB on the survival of these patients and to determine the risk factors associated with EB. Patients’ files were retrieved and retrospectively analyzed for the following data: demographics (age, gender), presence of comorbid conditions, history and clinical finding, model for end-stage liver disease (MELD) score, antimicrobial agents used, etiological cause of the underlying liver disease, and laboratory investigations. Hepatorenal syndrome defined according to the Revised Diagnostic Criteria for hepatorenal syndrome established by Salerno et al in 2007. MELD = 3.78 × ln [serum bilirubin (mg/dL)] + 11.2 × ln (INR) + 9.57 × ln [serum crea-tinine (mg/dL)] + 6.43. We studied the occurrence of EB within three months after diagnosis. EB was defined as the isolation of an Enterobacteriaceae species in at least one set of blood cultures within 90 days after diagnosis of HRF. If one patient experienced several episodes of bacteremia, only the first episode was considered. Because we studied the risk factor for developing EB during the three -month period, the 18 patients who died during this period were analyzed to see the number of days between bacteremia and death, source of bacteremia, and need for hemodiafiltration (HDF). Identification of blood isolates and susceptibility testing with commonly used anti-microbials were performed with a Wider I automated system (Dade Behring MicroScan, West Sacramento, CA, USA). It was considered as primary bacteremia if it was of unknown origin or related to an intra-vascular catheter and as secondary bacteremia if the source of the bacteremia was identified, i.e., when the blood isolate was cultured from another infected site (urine, intra-abdominal infection or peritoneal fluid, bronchoalveolar fluid, or sputum). The diagnosis of spontaneous bacterial peritonitis was made by more than 250 neutrophils in ascetic fluid and/or positive cultures after exclusion of other secondary causes of peritonitis. Ascitic fluid was centrifuged 20-min 3000 rotations/min, and out of the deposit, seeding was done on solid media, gelose blood, and gelose lactose, with incubation at 37°C and follow-up of bacterial growth. The diagnosis of urinary tract infection was made by clinical symptoms and signs (dysuria and fever), >15 leukocytes in urinalysis, and/ or positive urine culture (>100,000 CFU/mL). The diagnosis of respiratory tract infection was made by clinical symptoms and signs (cough, expectoration, pulmonary sounds, and fever), positive radiologic signs (patchy alveolar opacities), and/or positive bacteriologic examination (sputum or hemoculture). To diagnose sepsis and septic shock, the following clinical criteria were used: fever >38°C or hypothermia (<36°C), tachycardia (pulse >90/min), tachypnea (>20/min), hypo-xemia (<70 mm Hg), metabolic acidosis, and oliguria (diuresis <30 mL/min). Reasons for exclusion of analysis were incomplete patient files, and acute renal failure secondary to other pathologies. Authorization had been given from the Scientific Council and the Ethical Committee of our hospital. Data statistically described in items of mean and mode ± standard deviation. Comparison of numerical variables between the study groups was done using Student’s t-test for independent samples when comparing two groups and one-way analysis of variance test when comparing more than two groups. Within group, comparison of numerical variables was done using paired t-test. Correlation between various variables was done using Pearson moment correlation equation for linear relation. P <0.05 was considered statistically significant. All statistical calculations were done using computer programs Microsoft Excel 2007 (Microsoft Corporation, NY, USA) and Statistical Package for the Social Science (SPSS) version 15.0 for Microsoft Windows (SPSS Inc., Chicago, IL, USA). As demonstrated in [Table 1], Enterobacte-tiaceae occurred in 24 (32.5%) of 73 patients. Two-thirds of EB occurred within 10 days following the development of hepatorenal syndrome. They had comparable clinical and laboratory parameters to the remaining 49 patients without Enterobacteriaceae included in this study with an exception of mean serum creatinine, which was significantly higher when EB was identified (P <0.05). Table 1: Comparison of patients with or without occurrence of EB. [Table 2] shows that most of the patients with Enterobacteriaceae are males with mean age of 51 years. Posthepatitis cirrhosis is the main underlying liver disease. Associated comorbi-dities are shown in the same table. Table 2: Demographic and clinical characteristics of patients with Enterobacteriaceae (n =24). Fever was present in 79% of the patients, and 62.5% of the patients were complicated by septic shock. Cultures revealed that around half of the patients had Escherichia coli (E. coli) and the other 41.6% of the patients had Enterobacter and Klebsiella species, respectively while one case had Morganella morganii and other two cases had Serratia marcescens. Fifty percent of patients with Enterobacte-riaceae considered having primary bacteremia including three catheter-related episodes and nine episodes of unknown origin while the other 50% of secondary bacteremia referred to abdominal cause in 21%, pulmonary cause in 16.5%, and urinary cause in 12.5%, respectively. By comparison, between patients having primary and secondary bacteremia, most of patients in all groups had E. coli with an exception of patients with pulmonary origin as 50% of them having Klebsiella species. In addition, fever was more obvious in patients with secondary bacteremia. It presents in 100% of patients with pulmonary and urinary origin and in 80% with abdominal origin while it found only in two-thirds of patients with primary origin. Patients with secondary bacteremia seem to have more severe infection as 100% of patients with Enterobacteriaceae of abdominal and pulmonary origin were complicated with septic shock. This has resulted in an increase in the number of deaths in this group with the exception of urinary bacteremia that showed a lower mortality rate in comparison to only 50% in primary bacteremia group. Eighteen patients with EB (75%) had died. 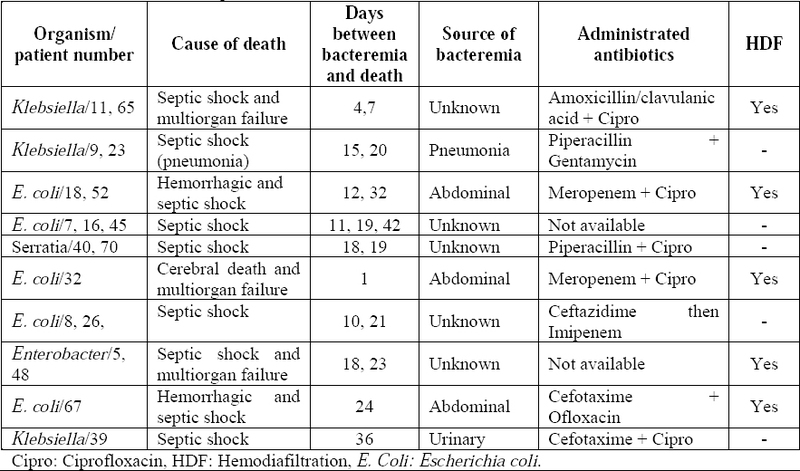 E. coli appeared in cultures of 50% of the patients who died due to either primary or secondary to an abdominal cause, and the last organism in the menu was Klebsiella secondary to urinary causes as shown in [Table 3] and [Figure 1]. Table 3: Clinical data for 18 patients with Enterobacteriaceae who died. 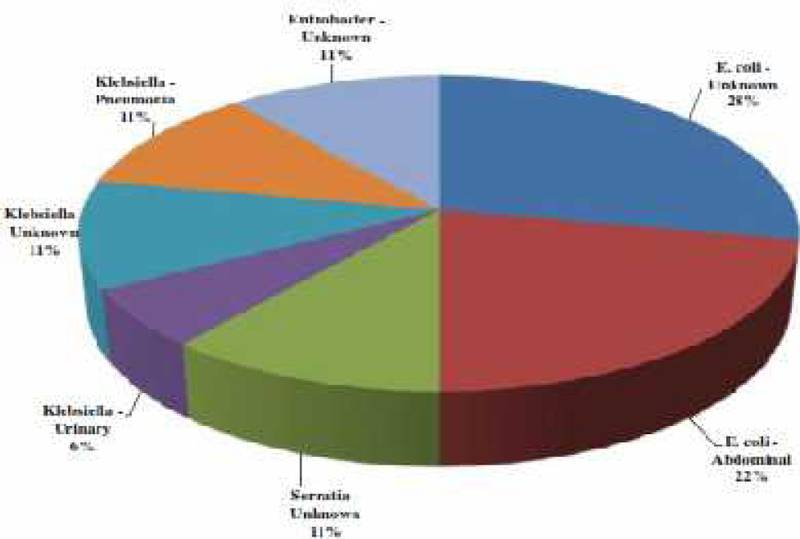 Figure 1: Organism and source of bacteremia among the 18 patients with Enterobacteriaceae bacteremia who died. The median time between bacteremia and death was 18.5 days (range of 1–42 days), and death was attributed to septic shock and multiorgan failure in most cases while cerebral death occurred in one case infected with E. coli. Patients received different antibiotic regimens according to the culture as shown in the same table. Eight patients (33.3 %) need HDF. The relation of this complication to attributed organism and the origin of infection are also shown in [Table 3]. Multivariate analysis of variables significantly associated with Enterobacteriaceae shows that MELD score >20, posthepatitis B and C liver cirrhosis, and serum creatinine level on intensive care unit (ICU) admission were significantly associated with the occurrence of Enterobacteriaceae as shown in [Table 4]. 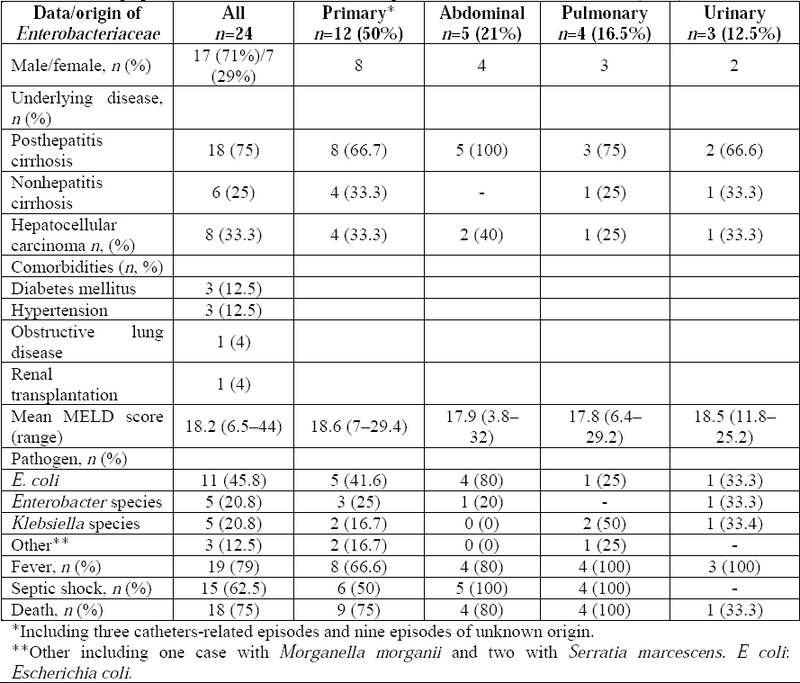 Table 4: Variables associated with occurrence of Enterobacteriaceae. Despite the fact that hepatorenal syndrome is relatively uncommon, it has received a considerable attention since it was described in the 19th century because it is not just a cause of acute kidney injury (AKI) in cirrhotic patients, but it considered as a multiproblematic cause of AKI in those patients. Hepatorenal syndrome creates a major economic burden as most of the patients have multiorgan failure, which necessitates an ICU admission, dialysis, shunt, or even transplan-tation. Mortality in hepatorenal syndrome may extend to months when the renal impairment is slowly progressive. Unfortunately, bacterial infection unlimitedly increases the mortality rate, which is already high from the beginning. The Enterobacteriaceae (EB) is a substantial group of Gram-negative bacteria that incorporates alongside with many harmless variants, a considerable number of familiar pathogens. Recently, EB was linked to hepatorenal syndrome by different mechanisms including bacterial translocation from the intestine. Members of this family are major causes of opportunistic infection in immunocompromised patients causing their death like our studied group of patients. We aimed this study to assess their impact on the mortality and to investigate the risk factors associated with EB in those patients. In our study, EB infections occurred in 32.5% of our patients. The high rate of infections could be attributed to multifactorial etiopathogenesis. Cirrhotic patients had a lower capacity for bacterial clearance and alterations in inflammatory responses due to the impaired function of the reticuloendothelial system (decrease in the number and function of Kupffer cells) along with the formation of collateral circulation allows the bacteria to reaching the systemic circulation directly. In our study, the most common pathogens involved are E. coli, Enterobacter, and Kleb-siella isolates, respectively. This is in agreement of many studies which reported that Enterobacteriaceae has the highest prevalence of infections in cirrhotic patients. Urinary EB was found in 12.5% in our patients, and we can refer this to the frequent use of urinary catheters and the concomitant diabetes mellitus in some cases. Literature review revealed that urinary tract infections (UTIs) occurred up to 20% in hospitalized cirrhotic patients with E. coli and K. pneumoniae and can be the source of bacteremia as well. Hyperkinetic circulation with a higher pulse rate and hypotension is common in cirrhosis. Disturbed conscious level and tachypnea could be caused by the encephalopathy itself without sepsis. In addition, increased prothrombin time and elevated liver enzymes can be seen in nonseptic cirrhosis. Thus, all these lead to delay in the diagnosis of sepsis and this may explain the very high rate of septic shock in our patients, as 100% of our patients with EB of abdominal and pulmonary origin were complicated with septic shock. Seventy-five percent of the patients with EB died. The median time between bacteremia and death was 18.5 days (range of 1–42 days). Patients with hepatorenal syndrome had impaired ventricular contractility, which become even worse in the presence of endotoxins, TNF, and other pro-inflammatory cytokines produced by Gram-negative bacteria, which may end in a cytokine-mediated septic cardio-myopathy. In addition, increased short-term mortality in our patients could be attributed to sepsis-related multiorgan failure, which considered the most common cause of patient mortality in ICUs. Prognosis of severe sepsis or septic shock is poor with hospital mortality rate from 30% to 70% in some studies. In addition, it can be attributed to the presence of comorbidities, which augments the immuno-suppression state of our patients. Moreover, the presence of renal dysfunction itself is a key indicator predicting death in patients with bacterial infection, particularly if irreversible. The most important finding of our study is MELD score >20; posthepatitis B and C cirrhosis and serum creatinine level on ICU admission were significantly associated with the occurrence of EB. Uremia increased susceptibility to infection and increased its severity due to changes in neutrophil chemotaxis, oxidative metabolism, phagocytic activity, degranulation, intracellu-lar killing dysfunctions, and dysregulated programmed cell death. In some reports, each 10 mL/min/1.73 m2 decrease in estimated glomerular filtration rate was associated with an 8% increased risk of infections. Renal failure in cirrhotic patients can be associated or precipitated by bacterial infections due to excessive response of pro-inflammatory cytokines. Biliary or gastrointestinal tract infections are more likely to be associated with the development of renal failure, followed by SBP and UTI, although other infections such as pneumonia or even skin infections are associated with the development of renal failure. Egypt is considered an endemic area for hepatitis C infections with the highest prevalence in the world, and also, viral hepatitis progressing to cirrhosis and ascites shows a higher susceptibility to SBP with a prevalence of about 10%–30%., This may explain the higher prevalence of post-hepatitis cirrhosis with EB in our patients. Earlier researches studied risk factors associated with EB infections which found that severe underlying illness, prolonged hospital stay, the presence of invasive medical devices, a higher MELD score, and lower mean arterial pressure are the main risk factors for the development of renal failure after bacterial infections. Our study had several points of strength because it is conducted on a considerable number of patients in an endemic area with hepatitis C and detection of these risk factors may help as regarding the patients’ survival in the future. However, as any research, we have some limitations, as it is a retrospective study so some data may be missing and is a single center experience. A study with subclassifi-cation of HRS to its subtypes will be considered in the future. Because of the high mortality in patients with cirrhosis who become infected, early identification of risk factors associated with EB infection may help in the therapeutic decision-making and allows for early implementation of appropriate infection prevention measures. Our study found that patients with post-hepatitis cirrhosis B and C, higher serum creatinine, and severe liver cell failure score have a high risk of developing EB. Bellot P, García-Pagán JC, Francés R, et al. Bacterial DNA translocation is associated with systemic circulatory abnormalities and intra-hepatic endothelial dysfunction in patients with cirrhosis. Hepatology 2010;52:2044-52. Albillos A, de la Hera A, González M, et al. Increased lipopolysaccharide binding protein in cirrhotic patients with marked immune and hemodynamic derangement. Hepatology 2003; 37:208-17. Borzio M, Salerno F, Piantoni L, et al. Bacterial infection in patients with advanced cirrhosis: A multicentre prospective study. Dig Liver Dis 2001;33:41-8. ? Mariappan S, Sekar U, Kamalanathan A. Carbapenemase-producing Enterobacteriaceae: Risk factors for infection and impact of resistance on outcomes. Int J Appl Basic Med Res 2017;7:32-9. Fukazawa K, Lee HT. Updates on hepato-renal syndrome. J Anesth Clin Res 2013;4:352. Heidemann J, Bartels C, Berssenbrügge C, Schmidt H, Meister T. Hepatorenal syndrome: Outcome of response to therapy and predictors of survival. Gastroenterol Res Pract 2015;2015: 457613. Salerno F, Gerbes A, Ginès P, Wong F, Arroyo V. Diagnosis, prevention and treatment of hepatorenal syndrome in cirrhosis. Gut 2007; 56:1310-8. Kamath PS, Kim WR; Advanced Liver Disease Study Group. The model for end-stage liver disease (MELD). Hepatology 2007;45:797-805. Caruntu FA, Benea L. Spontaneous bacterial peritonitis: Pathogenesis, diagnosis, treatment. J Gastrointestin Liver Dis 2006;15:51-6. Cadranel JF, Denis J, Pauwels A, et al. Prevalence and risk factors of bacteriuria in cirrhotic patients: A prospective case-control multicenter study in 244 patients. J Hepatol 1999;31:464-8. Fernández J, Navasa M, Gómez J, et al. Bacterial infections in cirrhosis: Epidemio-logical changes with invasive procedures and norfloxacin prophylaxis. Hepatology 2002;35: 140-8. Ruiz-del-Arbol L, Urman J, Fernández J, et al. Systemic, renal, and hepatic hemodynamic derangement in cirrhotic patients with spontaneous bacterial peritonitis. Hepatology 2003; 38:1210-8. Rice JB, White AG, Galebach P, et al. The burden of hepatorenal syndrome among commercially insured and medicare patients in the United States. Curr Med Res Opin 2017; 33:1473-80. Okusa MD. The inflammatory cascade in acute ischemic renal failure. Nephron 2002;90:133-8. Fernández J, Gustot T. Management of bacterial infections in cirrhosis. J Hepatol 2012;56 Suppl 1:S1-12. Fernández J, Acevedo J, Castro M, et al. Prevalence and risk factors of infections by multiresistant bacteria in cirrhosis: A prospective study. Hepatology 2012;55:1551-61. Garcia-Tsao G. Bacterial infections in cirrhosis: Treatment and prophylaxis. J Hepatol 2005;42 Suppl:S85-92. Papp M, Farkas A, Udvardy M, Tornai I. Bacterial infections in liver cirrhosis. Orv Hetil 2007;148:387-95. Cruz Rde C, Tanajura D, Almeida D, Cruz M, Paraná R. Urinary tract infection in non-hospitalized patients with cirrhosis and no symptoms of urinary tract infection: A case series study. Braz J Infect Dis 2006;10:380-3. Wong F, Bernardi M, Balk R, et al. Sepsis in cirrhosis: Report on the 7th meeting of the International Ascites Club. Gut 2005;54:718-25. Vincent JL, Gustot T. Sepsis and cirrhosis: Many similarities. Acta Gastroenterol Belg 2010;73:472-8. Naqvi SB, Collins AJ. Infectious complications in chronic kidney disease. Adv Chronic Kidney Dis 2006;13:199-204. Bunchorntavakul C, Chamroonkul N, Chavalitdhamrong D. Bacterial infections in cirrhosis: A critical review and practical guidance. World J Hepatol 2016;8:307-21. Lavanchy D. Evolving epidemiology of hepatitis C virus. Clin Microbiol Infect 2011;17: 107-15. Khan Z, Khan I, Din JU, Subhan F, Khan B, Khan H. Frequency of spontaneous bacterial peritonitis in cirrhotic patients with ascites due to hepatitis C virus and efficacy of cipro-floxacin in its treatment. Gomal J Med Sci 2009;7:149-54. Jackson H, Bhalme M, Quest L. Meticillin-resistant Staphylococcus aureus liver abscess. Br J Hosp Med (Lond) 2012;73:48-9.